A series of new character posters for The Walking Dead season 9 have been revealed, highlighting those amongst the core cast that have managed to survive this long. We're rapidly closing in on a decade's worth of stories within the post-apocalyptic zombie wasteland crafted by Robert Kirkman, initially in his Image Comics series of the same name. In that time, lots of beloved characters have met their demise and these new images are a sobering reminder of just how many have bit the dust over the years. The posters feature Daryl, Michonne, Carol and the young Judith, who has the sole responsibility of carrying on the Grimes name now that, as far as everyone knows, Rick is dead, even though he's not. He's just never coming back. But with Rick and Carl gone, it's up to Judith to carry the torch. Following Rick's departure, the show jumped forward in time several years, which gave us this slightly older version of Judith, a girl whose only ever known what it's like to live in a world dominated by Walkers. 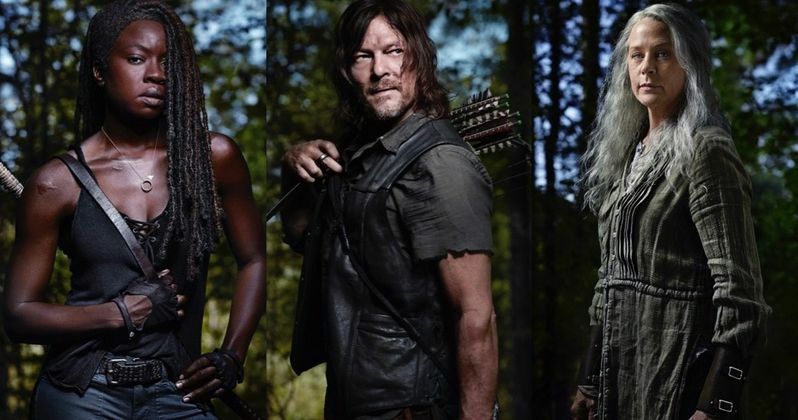 Then there's the trio of Carol, Michonne and Daryl, who have been with the show for the longest now. Daryl, specifically, is more or less the lead now that Andrew Lincoln is off to make a series of Walking Dead movies for AMC. But with other old favorites like Glenn, Maggie, Herschel and near countless others having moved on at this point, it's amazing to see who has survived and how they've survived. The road ahead, sadly, won't be getting any easier for them in the coming episodes, as they've got a brand new form of evil to contend with. At the tail end of the season 9 mid-season finale, we were briefly introduced to the Whisperers. This new brand of threat is pulled directly from the comics and they disguise themselves to blend in with the Walkers, making them very deadly and unique. They're set to become the main threat to the survivors in the back half of the season, which is poised to be very deadly. The leaders of this strange group, Alpha and Beta, have been hyped up quite a bit in the promos leading up to the second half of the season. Despite a steady decline in the ratings department, AMC is committed to the series and its expanding universe for years to come. The show was recently renewed for season 10, with Fear the Walking Dead going strong and the trilogy of Rick Grimes movies also on the way. For now, ratings decline be damned, since it's still easily one of the most popular shows on cable. The Walking Dead season 9 mid-season premiere is currently streaming on AMC Premiere and will debut on the network on Sunday, February 10. Be sure to check out the new character posters below. This news comes to us from Skybound.